Campaign and Alumni Relations Office journalist Simon Harvey reports from an evening of Olympic celebration and inspiration in London. At 8am on Thursday morning University of Nottingham alumna Anna Kent (Nursing 2003) finished a midwifery shift at the City Hospital in Nottingham. She went home, got changed, caught the train and arrived in London in time for the Nottingham 2012 reception hosted by the University’s Department of Sport and Recreation and Alumni Relations Office. With a few hours sleep after that she started her shift in the 24-hour Medical Centre at the London 2012 Olympic Games. Anna’s dedication and commitment to volunteering at the Games and that of countless other Nottingham alumni, who have given up their time and holidays to give something back, was celebrated at the reception as much as the University’s sporting prowess and pride in an ever-increasing number of high-profile and successful athletes. “Sometimes I’m quite cynical about corporate sponsorship-type things but when I saw the NHS presentation at the opening ceremony I had a tear in my eye and I’ve been ever so proud to be a part of it. I’m very very pleased that we can be an important host to people from all the other countries in the world who are enjoying their time here and joining in the celebration of being healthy and active in competition against each other,” she said. 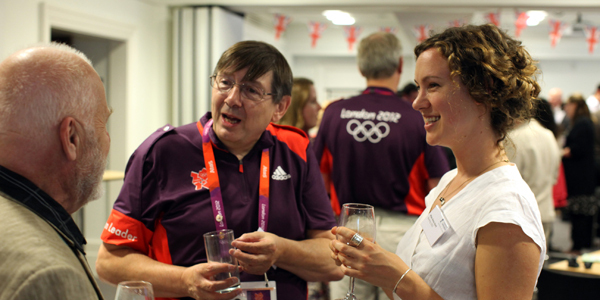 So Anna and more than a dozen Games making alumni took their place in the reception alongside Athens silver medal canoeist Campbell Walsh, Olympic rowing squad member Jo Cook and around 80 alumni and their guests for a celebration of sport and the Olympic spirit. Director of Sport Dan Tilley gave a run through of the University’s medal successes over the years. And as the night wore on one particular PhD student in the Department of Electrical and Electronic Engineering became incredibly popular. The queue for people to have their photos taken with Chris Hill’s Olympic torch, which he carried a few weeks ago, was never ending. Proof, if it were needed, of the enduring popularity and the pulling power of the Greatest Show on Earth. Find out more about the University’s Olympic contribution in our London 2012 Exchange special.